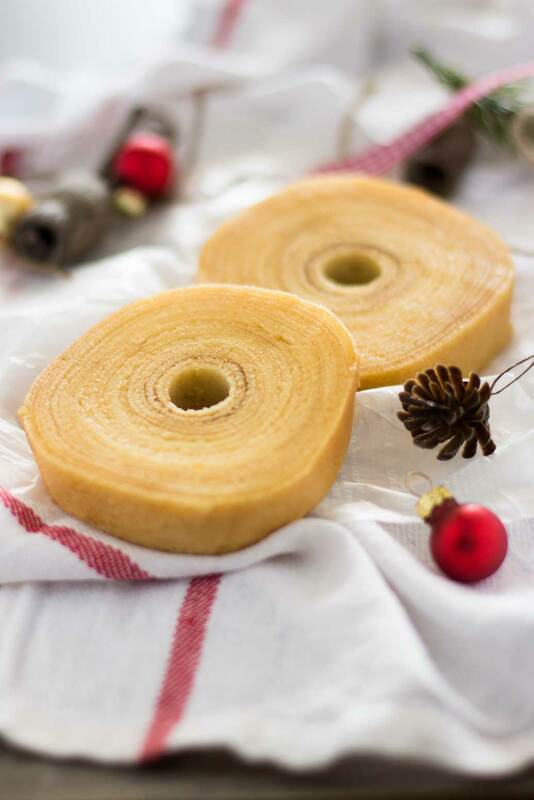 German Tree Cake “Baumkuchen” is more famous in Japan it is in Germany. I am going to visit my daughter, who is studying in Germany at the moment. Germany is covered with beautiful forests, which vividly show the transition of the four seasons like it is in Japan. It is not surprising that German people created sweets associated with forests and no wonder Japanese people love the cake. 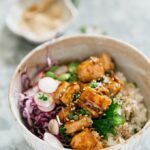 So I am going to share the Japanese German food recipes that I always believed were Japanese over the next few weeks. 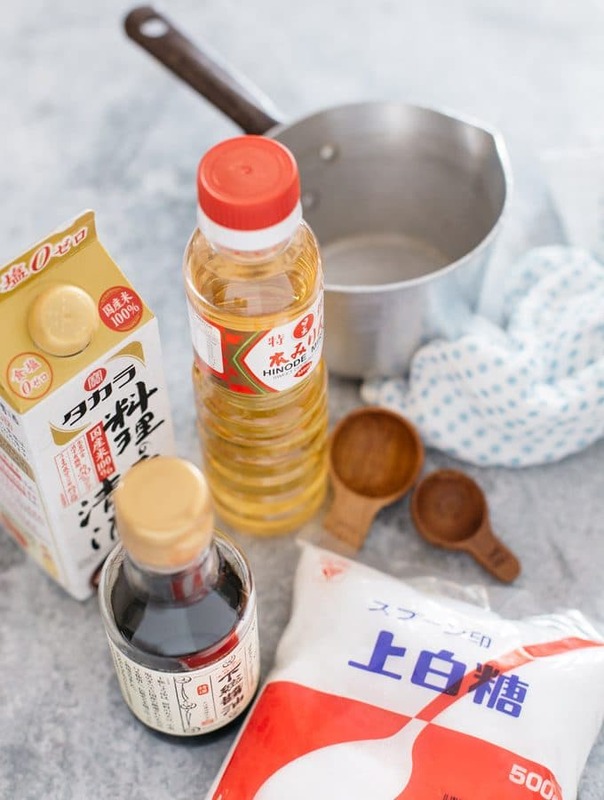 There are many dishes that originated outside of Japan such as Castella, and Chicken Nanban, which the Japanese people commonly cook and eat now. 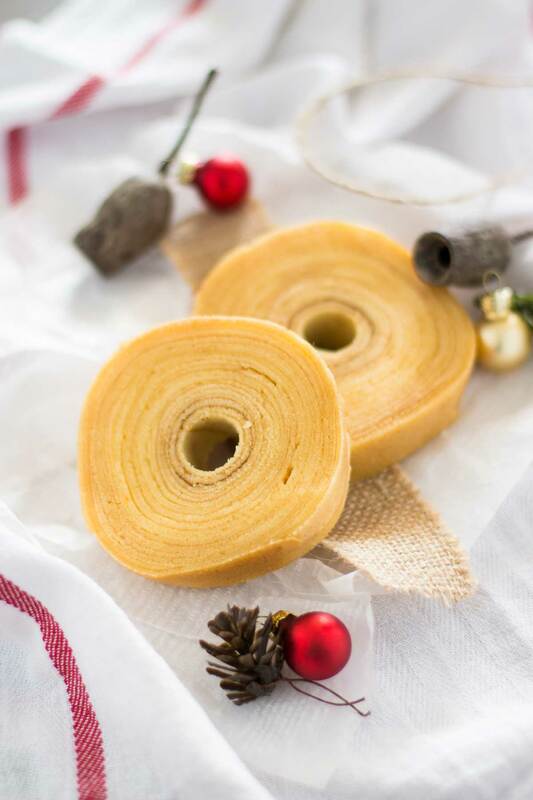 German Tree Cake, ‘Baumkuchen’ is one of them. A German confectioner, Karl Juchheim, introduced Baumkuchen to Japan. The company Juchheim(Japanese pronounce it You-hi-moo) is very famous in Japan. Their Baumkuchen is often used for presents given to guests at a wedding reception or, as souvenirs. This famous company’s headquarters is in Kobe. When my cousins and relatives come back to our home town for Obon or New Years, they often bring this as a souvenir. 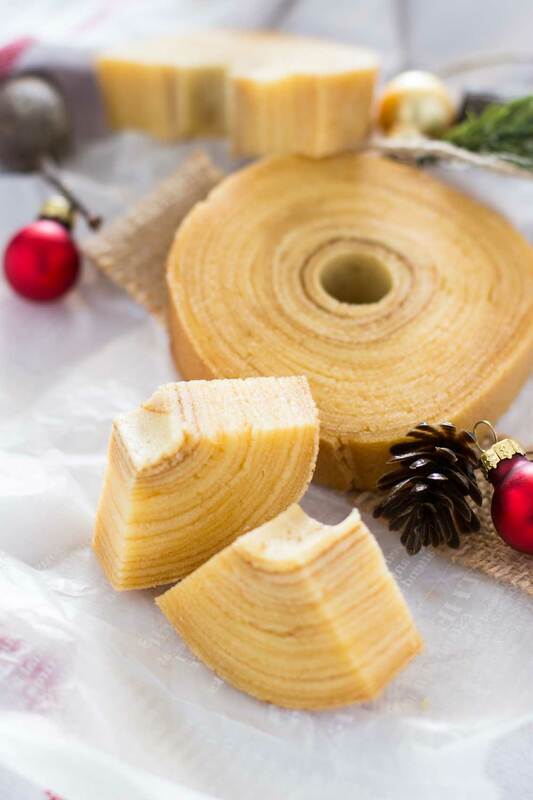 German Tree Cake Baumkuchen, is by far my favourite cake and luckily I can buy this cake here frozen in Brisbane. Since I am visiting the country of my favourite cake, I thought I’ll share the recipe however, I have never made this cake before. I did a little bit of research about this German Tree Cake especially how it is made into that shape. It is baked and layered into the shape of a tree, so when the cake is sliced, it resembles tree rings. 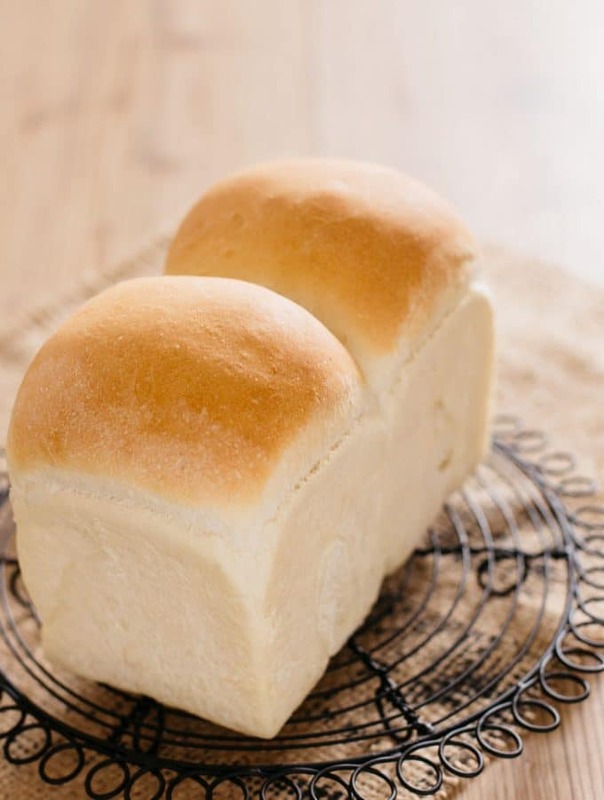 I can not make it in the same way as I would need a special oven with a cylinder shaped core that rolls inside the oven baking one layer at a time. Japanese people try to make it at home and many people make it using a frying pan. So I used a crepe pan to make it. I fried the first layer of thinly spread batter and then rolled it with a core which I make out of a wooden spatula wrapped with a baking sheet. After one layer cooked, I spread another layer then put the core back on the second layer and repeated the process until all batter was gone. I put my old baker’s hat and Gunte (Japanese work glove) on because it is really hot to roll the cake with bare hands. I am quite pleased with the result for the first attempt. It was delicious and looks the same as the Baumkuchen I used to eat in Japan. I cannot wait to visit Germany. I want to walk around and appreciate the nature by eating eating authentic Baumkuchen in Germany. I will update you about the real Baumkuchen soon! 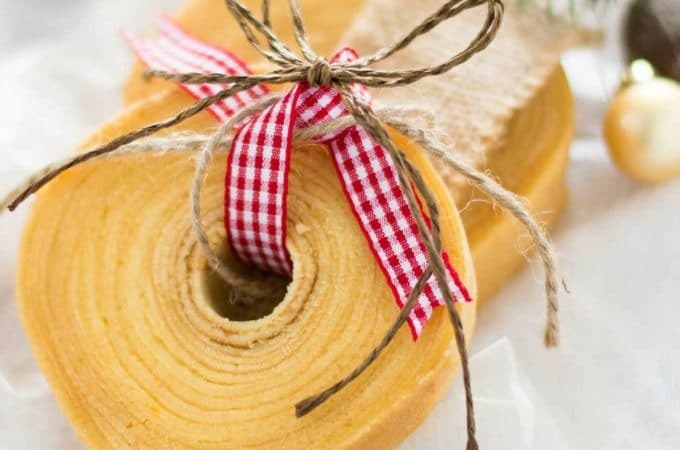 German Tree Cake "Baumkuchen" is the most well known German food and very popular cake in Japan. This is adopted in Japanese way to make Baumkuchen recipe. separate yolks and white. Leave the yolks in the room temperature and refrigerates the white. Sift plain flour and baking powder. 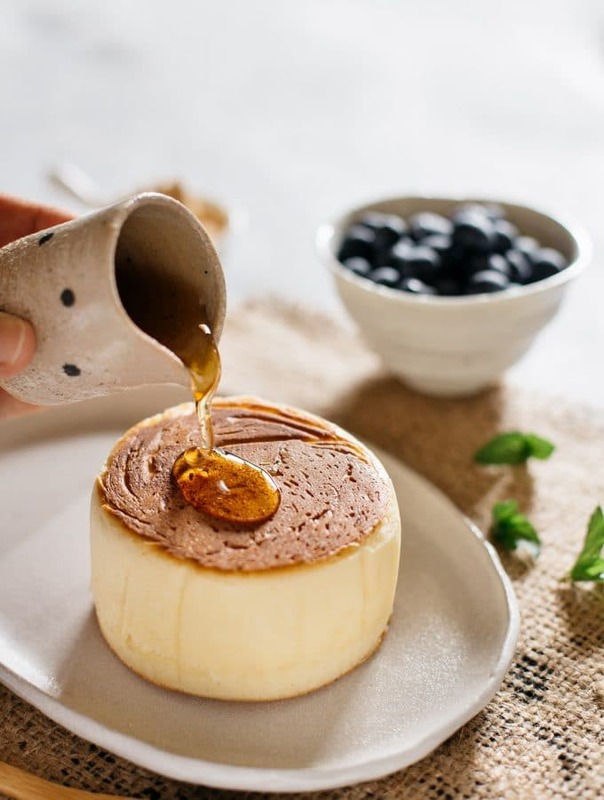 Place butter, milk and honey in a microwave proof bowl and place cling wrap. Microwave the milk and butter mixture for 1 minute on 600w to dissolve butter completely. Place egg white and 1/3 of the sugar and beat. Add another 1/3 of sugar and beat. Add the remaining of the egg white and beat until stiff. Add all egg yolks at once and mix well. Fold the sifted flour in three different times. Take a scoop of the mixture from step 7 and add it to milk and butter mixture. Mix them well, then return it to the flour and egg mixture and stir wll to make batter. Heat 24cm crepe pan grease the surface with oil and spread flat thinly and fry. When bubble formed, place the core on the edge of the batter and roll. Take it foo the pan and spread batter, repeat the process 11 for remaining batter. Cool the cake down, Take the core out and slice it about 2cm thick to serve. 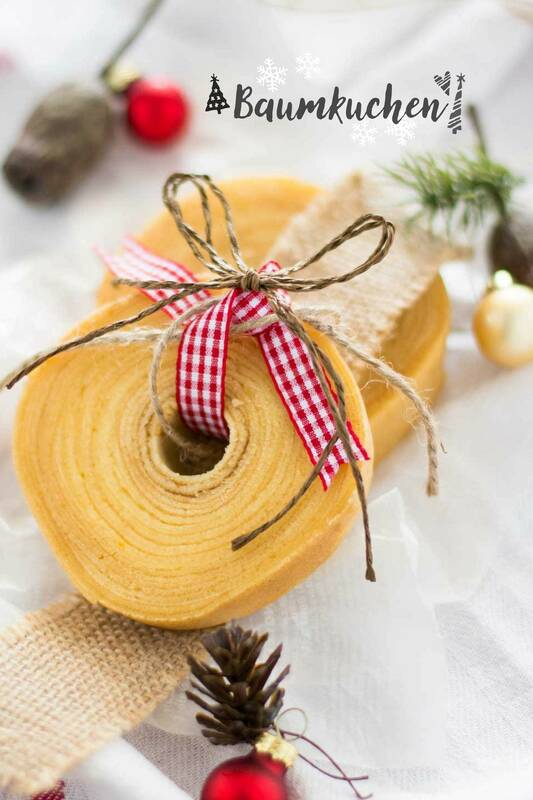 The German Tree Cake "Baumkuchen" is the most well known and loved German cake in Japan. This recipe is easy adopted recipe using frying pan. This can be baked one layer by on layer. I love ユーハイム Baumkuchen,, too. It was a treat when I was young. my mother used to buy them at Mitsubishi department store. I did not know that you could make it at home. That’s really impressive! I wanted to mark 5 stars but it doesn’t work for some reason. 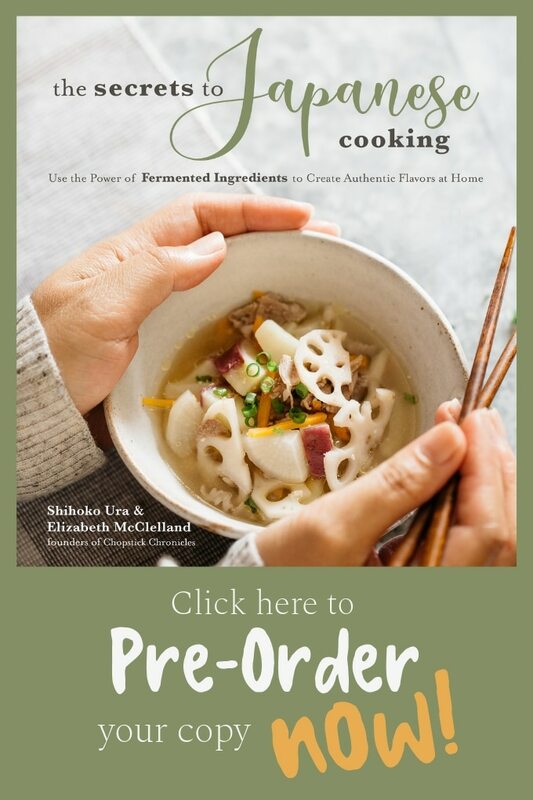 Hello Shihoko … I do love to read & look at your beautiful photos of the food you make . Please say hello to Elizabeth & send my love, I hear she is loving Germany & traveling. Thank you Tracy 😀 I have just arrived in Frankfurt this morning and saw a lots of food. So I will post them up soon. Hallo! 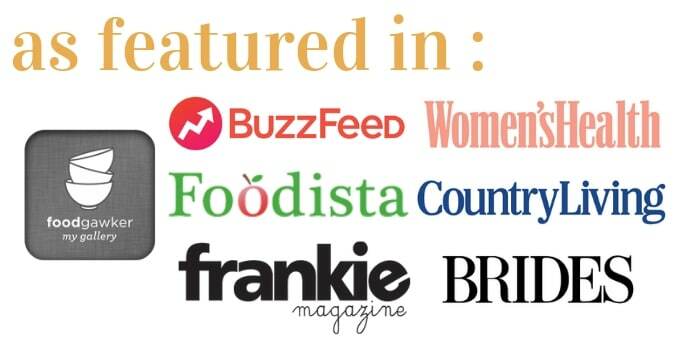 Thank you for visiting Chopstick Chronicles 😀 Yes it is very popular and perhaps more popular and famous than it is in Germany. I love it so much too and love the round shape <3 but it is good idea to use regular tin to bake it layered 😀 Thank you for the link. I wants to make authentic schnitzel too! so will look this site. Thank you!! Hi! 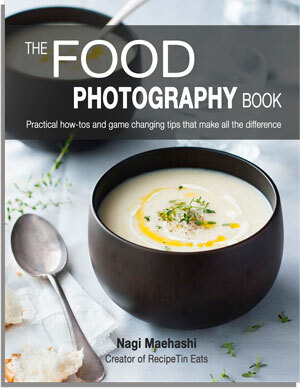 I’m so looking forward to making this! I just wanted to ask, is it definitely 2 tablespoons of baking powder? Or is it meant to say 2 teaspons? Oh okay, thanks for the speedy reply! Hopefully I can make these tonight! Hi Shihoko, Can you please help to know when to add in the 1Tb honey? Assume it’s when folding yolks.. Thanks! Hi Shihoko, thanks for your prompt reply. 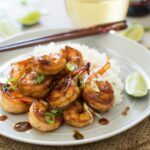 I did try this recipe last night and had a lot fun. 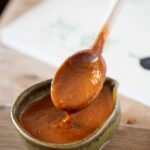 The texture and flavor are awesome… Thank you for sharing!!! 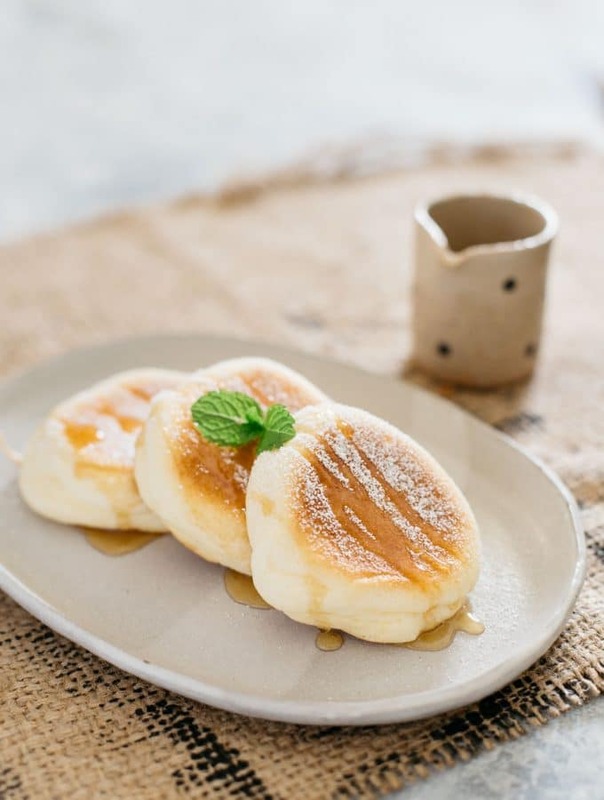 Hi Shihoko, I live in Brisbane and would like to buy the frozen Baumkuchen you mention. Can you tell me which shop sells it? Thank you. Hi Mar, I usually go to either Genki Mart in Alderley( I dont think they have website) or Fuji Mart in Buranda Village 😀 or some of Chinese grocery stores have in their freezer too. I saw one in Indooroopilly shopping centre but not sure the name of the shop. This german tree cake looks sooo good! I got some at Mitsuwa (a japanese supermarket) and it was so f-ing expensive, I decided to try and make some. 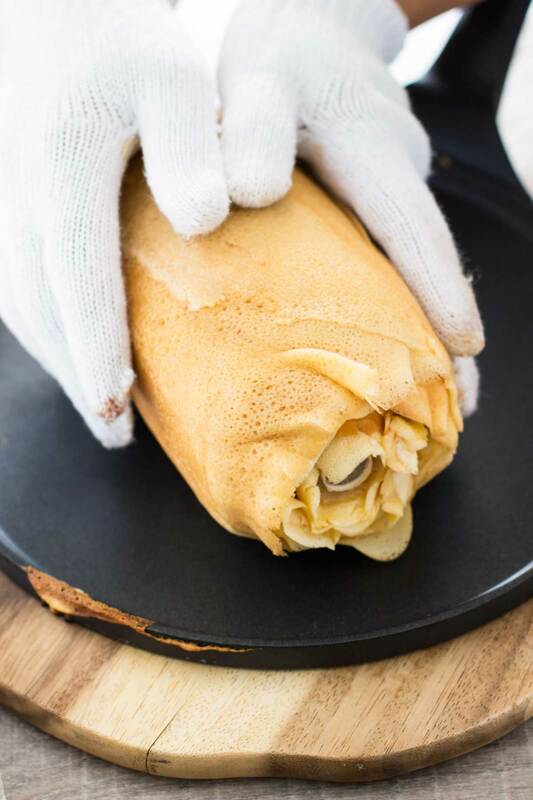 By the way, do you need to use a crepe pan?